The first step, between the previous blog on creating a data feed and this guide to setting up a Shopping Campaign, is to link your accounts. 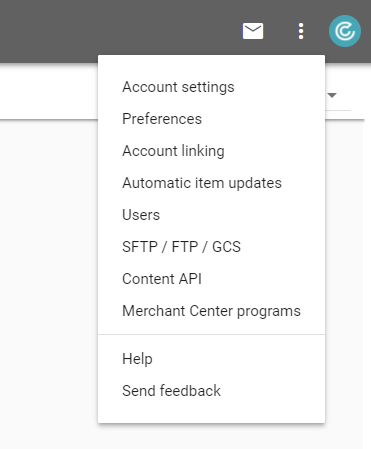 This is done in Google Merchant Center (GMC) where, if you click on the top right hand menu (three dots), you can select ‘Account linking’. This will take you the ‘Account linking’ page where you can select ‘link account’ and enter your Google Ads customer ID. You can then select ‘Send link request’. Once your accounts are linked, you’ll need to begin a new campaign. 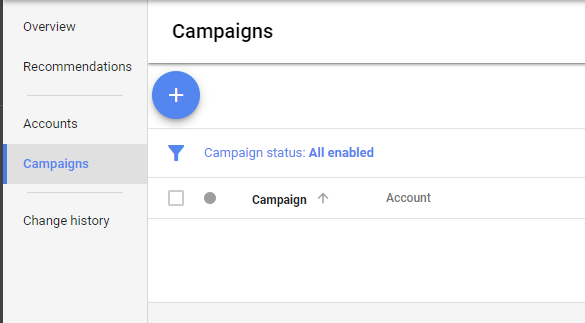 You can do this in your Google Ads account by selecting the ‘Campaigns’ option from the top menu, then again from the left side menu before adding your campaign with the blue plus button. This will take you to a page from which you can select your campaign type (for the purposes of this, you’ll obviously need to select ‘Shopping’). Boost sales through campaign optimisation, conversion tracking and audience lists. Once you’ve selected your aim, you’ll be asked to select your GMC property and your target location. As the majority of Shopping Campaigns are to increase sales, we’re going to proceed from here as though creating a ‘Sales’ targeted campaign (though much of the process remains the same). Once you click continue, you will be presented with a number of options boxes; the first of which is ‘Shopping Campaign settings’. 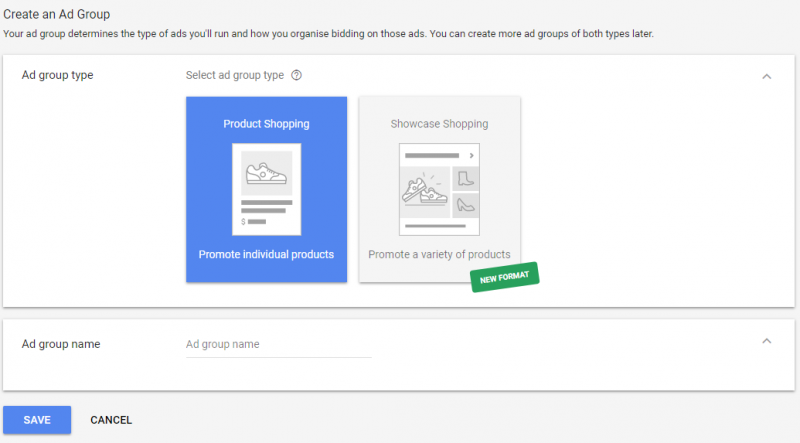 These offer you the chance to assign a name and, if you need to, any inventory filters you want to add to the campaign, as well as adding custom URL parameters if there is a specific URL you want to send consumers through before they reach your landing page (if you are carrying out monitoring or tracking beyond that in Google Ads and Analytics). Maximise clicks – sets your bids automatically to earn as many clicks as possible for the total budget. You can set a maximum CPC with this option to limit the cost, but this can impact the number of clicks. Target ROAS – ROAS, or ‘return on advertising spend’ will set your bid to attempt to maximise conversions. You can set a percentage value for this, though the percentage is not a guarantee of success. Manual CPC – allows you set your own maximum CPC for your ads, removing the automated aspect. Budget is where you set the maximum spend for the day. While the spend may exceed or fail to meet this value on certain days, Google guarantees that your monthly spend will never exceed the daily spend on the account multiplied by the average number of days in the month. You can choose either standard (evenly over time) or accelerated (as fast as possible) spend for whichever budget is selected by expanding the ‘Delivery method’ link. 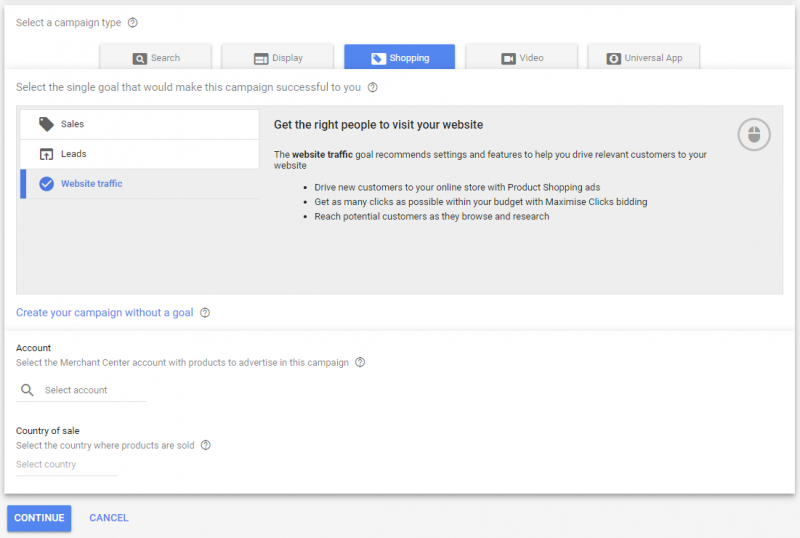 This aids Google when it comes to deciding which bid to use if you have the same product in multiple campaigns. The campaign with the highest priority will decide the bid where applicable, otherwise it will default to the highest bid where all priorities are equal. 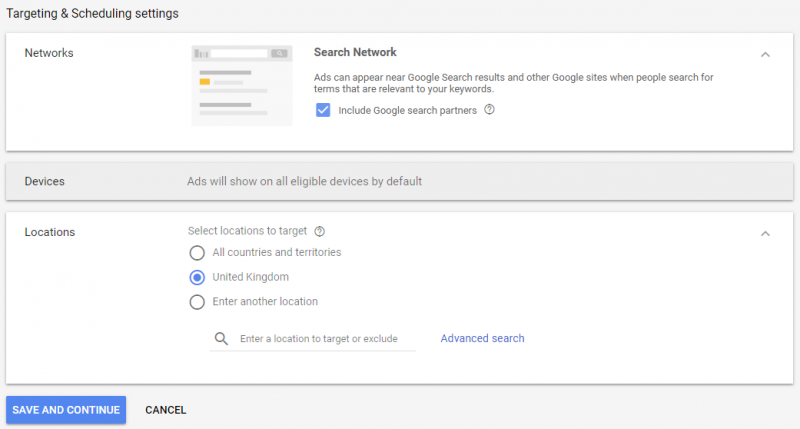 This section allows you to opt in to or out of the Search Network (appropriate Google partners), and to select a target location. Product Shopping – which uses a single product from your feed to be promoted. Showcase Shopping – which allows you to select an array of products to better represent your brand as a whole. As a point of best practice, we tend to recommend the use of one product per ad group, allowing you greater overall control. In addition, we would recommend optimising your campaigns in a number of ways which we’ll deal with in an upcoming eBook covering Shopping Campaigns from start to finish. For more actionable insights – on PPC or SEO or any other aspect of search marketing, sign up to our blog, or check out our large and growing collection of resources.